The Bouvier des Flandres was originally bred to be a versatile farm dog. He helped farmers in a multitude of tasks, including herding livestock (particularly cattle), pulling carts, and guarding. The hard-working and intelligent Bouvier is still an ideal farm dog, as well as a capable service, assistance, law enforcement, and guard dog. And while you can also find him competing in obedience, agility, and herding trials, serving as family companion is the role that seems to suit him best. See below for complete list of Bouvier des Flandres characteristics! 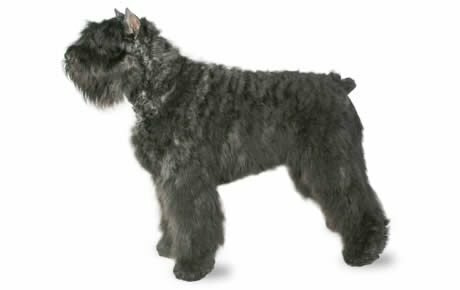 With his tousled coat and powerful build, the Bouvier des Flandres embodies a rugged adventurer packed with strength, endurance, and vigor. Originally bred to be a hard-working farm dog, he aslo makes a great family pet who thrives among the people he loves. While his appearance is striking, the appeal of this dog is often found in his intelligent and serene nature. As a member of the Herding Group, he has a tendency to herd moving objects, including children, people on bikes, and joggers. He is naturally protective of his "flock," and will defend his family should the need arise. However, he is not aggressive without cause. Fearless and confident with a strong personality, the Bouvier is a natural athlete outdoors, but he is also happy hanging out with you inside. While not terribly high-energy, he does need vigorous exercise to keep healthy. He can live comfortably in small quarters, such as a condo or apartment, but it's important he is walked or exercised several times a day. The Bouvier does well with training and generally learns quickly. Still, since he can be strong-willed and sometimes stubborn, he's not recommended for first-time or timid owners. Neither is he recommended for owners who can't stand a mess. His shaggy coat is a mud-burr-dirt magnet so he's prone to tracking dirt and debris throughout the house. Perhaps most annoying is his amazingly odiferous flatulence. For those, however, who embrace his strong personality, extreme grooming needs, large size, and protective nature, the Bouvier can be a great choice. The Bouvier is not recommended for fastidious people who can't stand a mess. Although he can be tidied up with a significant amount of elbow grease, his coat tends to collect dirt and debris, which in turn is deposited throughout your house. Not surprisingly, the Bouvier requires a lot of grooming — which can be time-intensive and/or expensive. Because of his assertive personality, this breed is not recommended for first-time dog owners. The Bouvier's size, herding instinct, and strong personality make leash training highly advisable. The Bouvier is happiest when he is with his family. As you might expect, the Bouvier des Flandres originates from the European region of Flandres, and the name means either "cow herder" or "ox herder from Flandres." A versatile farm dog, the Bouvier was used to herd cattle, guard the herd, pull carts, and help the farmer and his family in a multitude of tasks. The development of the working Bouvier seemed to be a matter of practicality. His exact ancestry is unknown, but he may be descended from early Sheepdogs, the Dutch Griffon, and the Barbet. The Bouvier worked as a service dog during both World Wars, and was also used as a messenger, a sentry (especially by the United States military), and a search dog to locate ammunition and mines. The first standard for the Bouvier was developed in 1912 by the vice president of the Club St. Hubert du Nord in Europe. The Bouvier came to the United States in the 1920s, and was recognized by the American Kennel Club in 1929. The breed's working heritage is highly prized. In Belgium, a Bouvier cannot win the title of conformation champion unless he has also proven himself as a working dog. Males stand about 26 inches tall and females stand about 25 inches tall. Weight varies from 70 to 100 pounds. The Bouvier is known for being intelligent, protective, and strong willed. Not surprisingly, this herding dog likes to gather and protect his flock. He is deeply attached and devoted to his family, and happiest when he's a part of the action. Left alone for long periods of time, he's like to get bored — and resort to annoying behaviors like barking, chasing, and chewing — as well as become very unhappy. The Bouvier maintains a stiff upper lip, however, when it comes to showing affection for his family. He is not likely to jump for joy, Golden Retriever-style, when you return home, but is more likely to quietly show his devotion by curling up at your feet. The Bouvier has a strong personality: He needs an owner who can kindly and consistently show leadership, otherwise, he's likely to fill the void. This doesn't mean you should take a drill sergeant approach, but you must act the confident leader and consistently, albeit gently, enforce guidelines. Like every dog, the Bouvier needs early socialization — exposure to many different people, sights, sounds, and experiences — when young. Socialization helps ensure that your Bouvier puppy grows up to be a well-rounded dog. Bouviers are generally healthy, but like all breeds, they're prone to certain health conditions. Not all Bouviers will get any or all of these diseases, but it's important to be aware of them if you're considering this breed. Elbow Dysplasia: Similar to hip dysplasia, this is also a degenerative disease. It's believed to be caused by abnormal growth and development, which results in a malformed and weakned joint. The disease varies in severity: the dog could simpy develop arthritis, or he could become lame. Treatment includes surgery, weight management, medical management, and anti-inflammatory medication. Ectropion: Another eye condition, Ectropion is the rolling out or sagging of the eyelid, leaving the eye exposed and prone to irritations and infection. If severe, surgery is required, but in mild cases, no treatment is necessary. Subvalvular Aortic Stenosis: This is a heart problem is caused by an abnormally narrow connection between the left ventricle and the aorta. Fainting is the main symptom, eventually leading to heart failure and death. Your vet can detect it and prescribe the proper treatment. Gastric Torsion: Also called bloat, this is a life-threatening condition that can affect large, deep-chested dogs such as Bouviers. This is especially true if they are fed one large meal a day, eat rapidly, drink large volumes of water after eating, and exercise vigorously after eating. Bloat is more common among older dogs. GDV occurs when the stomach is distended with gas or air and then twists (torsion). The dog is unable to belch or vomit to rid himself of the excess air in the stomach, and the normal return of blood to the heart is impeded. Blood pressure drops and the dog goes into shock. Without immediate medical attention, the dog can die. Suspect bloat if your dog has a distended abdomen and is salivating excessively and retching without throwing up. He also may be restless, depressed, lethargic, and weak, with a rapid heart rate. It's important to get your dog to the vet as soon as possible if you see these signs. Addison's Disease: Also known as hypoadrenocorticism, this is an extremely serious condition caused by an insufficient production of adrenal hormones by the adrenal gland. Symptoms include vomiting, a poor appetite, and lethargy. Because these signs are vague and can be mistaken for other conditions, it's easy to misdiagnose until it reaches more advanced stages. More severe symptoms occur when a dog is stressed or when potassium levels get high enough to interfere with heart function, causing severe shock and death. If Addison's is suspected, your vet may perform a series of tests to confirm the diagnosis. Cushing's Disease: Also known as hyperadrenocorticism, this condition sets in when the body produces too much cortisol, sometimes due to an imbalance of the pituitary or adrenal gland. Common signs are excessive drinking and urination. If your Bouvier exhibits these two symptoms, take him to the veterinarian. Treatments include surgery and medication. In Bouviers, you should expect to see health clearances from the Orthopedic Foundation for Animals (OFA) for hip dysplasia (with a score of fair or better), elbow dysplasia, hypothyroidism, and von Willebrand's disease; from Auburn University for thrombopathia; and from the Canine Eye Registry Foundation (CERF) certifying that eyes are normal. You can confirm health clearances by checking the OFA web site (offa.org). The Bouvier des Flandres is happy to lie around the house and enjoy the luxuries of companionship. He isn't highly active, but he does need regular exercise. He lives comfortably in the city or country. You'll need to take special care if you're raising a Bouvier puppy. Like other large breeds, the Bouvier grows very rapidly between the age of four and seven months, making him susceptible to bone disorders. Don't let your Bouvier puppy run and play on very hard surfaces such as pavement or pull a cart until he's full grown and his joints are fully formed. 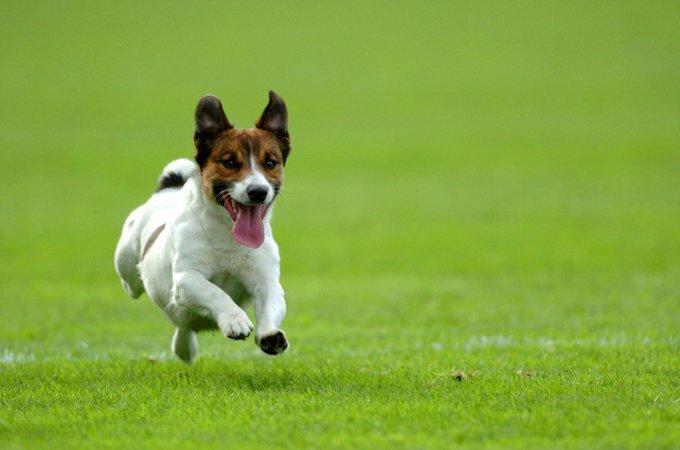 Normal play on grass is fine, as is puppy agility play, with its one-inch jumps. Training should begin the day you bring your Bouvier puppy home. He is generally eager to please so training is fairly easy. But he can be stubborn, so owners must be consistent and firm to overcome his dominant personality. Another important step in training a Bouvier des Flandres puppy is socialization. Socialization is the process by which puppies or adults dogs learn how to be friendly and get along with other dogs and people. The Bouvier can be suspicious of strangers and very protective of his family — good qualities for a herding dog. Socialization will prevent him from becoming overly shy or protective. You can take the Bouvier puppy to many places that allow dogs, like pet supply and building supply stores to familiarize the dog to strangers and unfamiliar situations. Puppy training classes are highly recommended. Crate training is an important aid in housetraining, and it keeps the Bouvier safe and out of trouble when you are away from home. But he shouldn't spend more than a few hours at a time in it except when he's sleeping at night. Bouviers aren't meant to spend their lives locked up in a crate or kennel. Leash training is a must with the Bouvier. Although the breed is not known for wandering off, he is known for a strong herding drive. He may be unable to resist the temptation to chase people on bikes, cars, or other animals, which can endanger him and others. Tail docking is usually done when pups are very young. You can choose to crop his ears, or not. It requires surgery and several months of care after. If you like the look of cropped ears, factor in the care and expense, as well. Recommended daily amount: 3 to 5 cups of high-quality dry food a day, divided into two meals. You'll need to take special care if you're raising a Bouvier puppy. Like other large breeds, the Bouvier grows very rapidly between the age of four and seven months, making him susceptible to bone disorders. Feed your puppy a high-quality, low-calorie diet that keeps him from growing too fast (22 to 24 percent protein and 12 to 15 percent fat). Keep your Bouvier in good shape by measuring his food and feeding him twice a day rather than leaving food out all the time. If you're unsure whether he's overweight, give him the eye test and the hands-on test. For more on feeding your Bouvier, see our guidelines for buying the right food, feeding your puppy, and feeding your adult dog. The Bouvier des Flandres is blessed (or cursed, depending on you look at it) with a weather-resistant double coat. The outer coat is coarse and long; the undercoat is fine and dense. It appears in several colors, including fawn, black, salt and pepper, and brindle, and sometimes a white star is found on the chest. His Dutch nickname, Vuilbaard, means "dirty beard," and like all dogs with a fluffy coat, the Bouvier gets grubby fairly easily. Expect muddy paws, leaves or burrs, feces on the hindquarters, or a wet, dirty beard. The Bouvier's thick coat needs to be brushed several times a week, and it's a great idea to check the coat for burrs, ticks, or weeds every day. Bathe him every six to eight weeks, and trim his coat every few months. Many owners hire a professional to groom their Bouvier, though you still need to brush thoroughly on a very regular basis. If you are considering the Bouvier, consider the time and/or expense required for his upkeep. Brush your Bouvier's teeth at least two or three times a week to remove tartar buildup and the bacteria that lurk inside it. Daily brushing is even better if you want to prevent gum disease and bad breath. Begin accustoming your Bouvier to being brushed and examined when he's a puppy. Handle his paws frequently — dogs are touchy about their feet — and look inside his mouth. Make grooming a positive experience filled with praise and rewards, and you'll lay the groundwork for easy veterinary exams and other handling when he's an adult. The Bouvier is a wonderful family dog who is devoted and protective with his family, including children. He may wish to herd his children with nudges and barks. To best teach him to get along with kids, he should be raised with them or, if he doesn't live with them, he should be exposed to children as he grows up. The Bouvier should be raised with other dogs and animals for the best chance at getting along with them when he grows up. If he is socialized and trained properly, he usually just ignores other animals in his household. Buy hid instinct to herd and chase is strong, supervision is always a good idea. Bouviers are often acquired without any clear understanding of what goes into owning one. There are many Bouviers in need of adoption and or fostering. If you don't see a rescue listed for your area, contact the national breed club or a local breed club and they can point you toward a Bouvier rescue. Below are breed clubs, organizations, and associations where you can find additional information about the Bouviers.